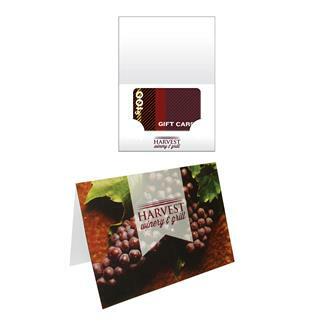 Gift card holders are a great way to personalize your gift cards, with imprint on both sides. This card will hold standard size gift cards. Custom imprinted, offset on 12 pt. paper board and liquid laminated for a high gloss finish. Perfect for restaurants, hotels, malls, thank you client gifts or any retail establishment.